How do switches, vSwitches and distributed vSwitches differ? 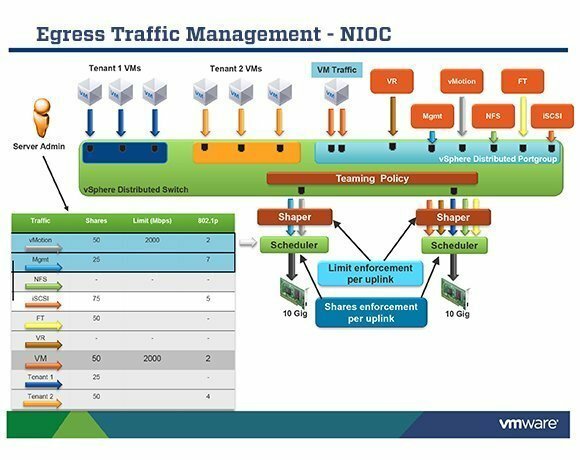 In a VMware environment, switches bring the physical network to virtual machines (VMs), while standard virtual switches and distributed virtual switches enable a sophisticated virtual network topology between VMs, hosts and host clusters. A network switch directs network traffic. Similarly, a virtual switch (vSwitch) carries VMs' traffic to the physical network and to other VMs. Distributed vSwitches, which are also known as VMware vDS, enable more features than standard vSwitches, sometimes called VMware vSS. A standard vSwitch works within one ESX/ESXi host only. Distributed vSwitches allow different hosts to use the switch as long as they exist within the same host cluster. A distributed vSwitch extends its ports and management across all the servers in a cluster, supporting up to 500 hosts per distributed switch. Instead of making virtual networks more complicated with its additional options, the distributed vSwitch simplifies operations and helps catch configuration errors and increase network visibility.